HealO Medical® is dedicated to alleviating the suffering and high cost associated with the treatment of chronic and acute wounds. The magnitude of wound care problem globally can reliably be expected to grow at a faster rate due to the convergence of five major epidemiologic factors: burgeoning aging population, rising incidence of diabetes, obesity epidemic, mutating drug-resistant microbes, and a virtually dry antibiotic pipeline. There are one million amputations per year globally, two every second, and one every 20 seconds due to diabetes. While many wound care products (from advanced dressings to NPWT devices) exist on the market, none is able to sufficiently overcome the impoverished blood flow and tissue oxygenation—the two biggest challenges facing chronic wounds—to enable healing faster than the current average time of nearly 6 months. Wound care therefore continues to be a serious, growing problem for patients, healthcare professionals and facilities, government, and third-party payors. HealO Medical has developed technologies that are exceptionally effective in reversing hypoxia and hypoperfusion while eliminating tedious nursing care, pain, and suffering. Our mission is to deliver faster healing, reduce suffering, and cut healthcare costs. HealO’s patented and patent pending ClearHeal® clear-view wound healing chambers, and BeneHeal® super dressings, in conjunction with O-ACE-Sys®, our proprietary smart control module, enables custom delivery of a variety of therapeutics (including proteolytic enzyme soaks, antibiotic lavage, analgesic instillation, etc.) directly to the wound site. The platform also provides an optimized micro-environment for the incubation of high-value bioengineered materials (stem cells, tissue grafts, growth factors, etc.). 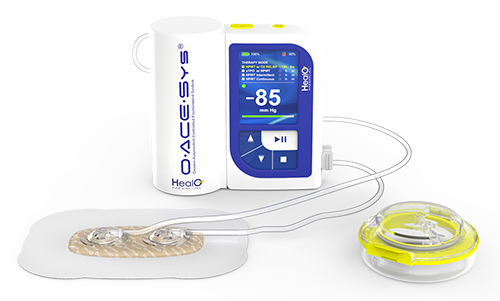 O-ACE-Sys® is a patented, integrated, multi-modal therapeutic delivery platform designed to accelerate the healing of chronic and acute wounds. A compilation of relevant publications can be downloaded here. *Source: Caroline E. Fife, MD, CWS, et. al., Wound Care Outcomes and Associated Cost Among Patients Treated in US Outpatient Wound Centers, WOUNDS, 2012; 24(1): 10-17. O-ACE-Sys is not available for sale in the USA, pending FDA clearance. © 2018 HealO Medical, LLC. All Rights Reserved.